Enable the Content Advisor. Click OK. Enter a Default Supervisor password. After this next step is to set the password. To do so, click on Settings > General tab in the Content Advisor. Tick the option like in the screenshot below. Click on Change Password and Choose a password. 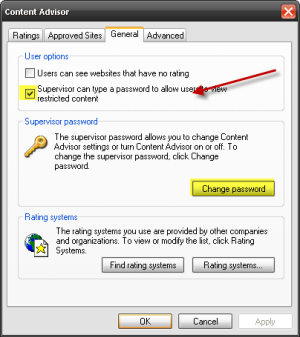 To fully protect the browser to prevent others from accessing, adjust the ratings slider to None so that no website can be opened without a password. The content control in IE is now password protected. You can’t it unless you enter the password. You will be prompted for your password everytime you will the content control panel. In Options window , click on the security tab and check Use a master password. Thats it. You have created a master password and next time you open firefox, you will be promoted to enter the master password when you try to enterstored passwords into the sites. The master password just protects info such as passwords, but if you are looking to protect the entire Firefox profile, then use the ProfilePassword add-on for firefox. 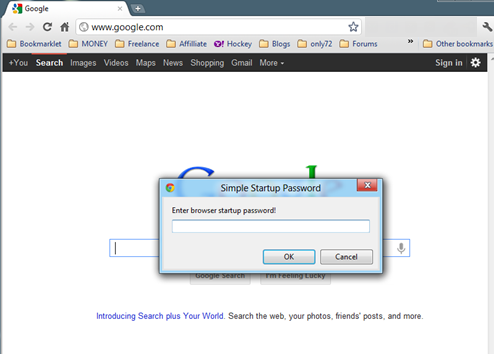 Search for Simple Startup Password and click on the Options for that Extension. Now you can Experience the freedom to use an Android/iOS/Windows/Mac based device to access Windows applications with the desktop in the cloud by CloudDesktopOnline . Alternatively, Rent a server at affordable prices in the market by www.Apps4Rent.com.